Spencer Drummond Limited, Hamilton, Bermuda; William B. O'Neal [1907-1994], Charlottesville, VA, February 1979; gift to NGA, 1991. Dürer to Diebenkorn: Recent Acquisitions of Art of Paper, National Gallery of Art, Washington, D.C., 1992, no. 14. 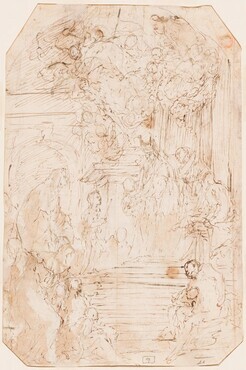 Drawings from the O'Neal Collection, National Gallery of Art, Washington, D.C. 1993, no. 6. 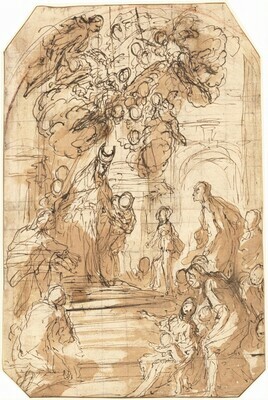 Drawings from the O'Neal Collection, Georgia Museum of Art, The University of Georgia, Athens, 4 May-16 June, 1996 (recto only). The Poetry of Light - La poesia della luce: Venetian Drawings from the National Gallery of Art, Museo Correr, Venice, Venice, 2014 - 2015, no. 44. Dürer to Diebenkorn: Recent Acquisitions of Art of Paper, National Gallery of Art, Washington, 1992: 18, 23-24. Drawings from the O'Neal Collection. Exh. cat. Washington, 1993: 25-26.